im Forum Stadtpark Keller - like back in the days. Wir buttern und pimpen, machen Party wie früher. Get your invitations now! 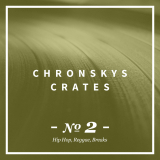 Chris Chronsky´s monthly mixshow on Brooklyn Radio. It´s all about Hip Hop, reggae and Breaks. Tune in now!